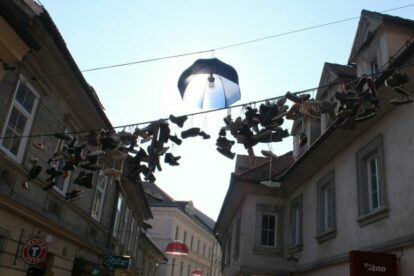 In Ljubljana, there are many streets with shoes on a wire. The origins were explained in another Ljubljana spot where shoes were hung up over the Cobblers’ bridge in the city centre. But each and every one of them was removed recently by the municipality, even though they were a popular tourist attraction. On Trubarjeva cesta, exactly the same street where the Dežnik shop is as well (check Dežnik article), there are several wires spanned across the street where hanging shoes remain present. The origins of the latter were unknown to me until recently. Recently the “shoe hanging” custom has become quite a hit as pairs multiply daily. As for me, I once hung a pair of my worn-out sneakers and left barefoot. For the time being nothing has changed yet, but you never know.